If you ever wanted a graphic demonstration of wicked, terminal understeer—here you go. 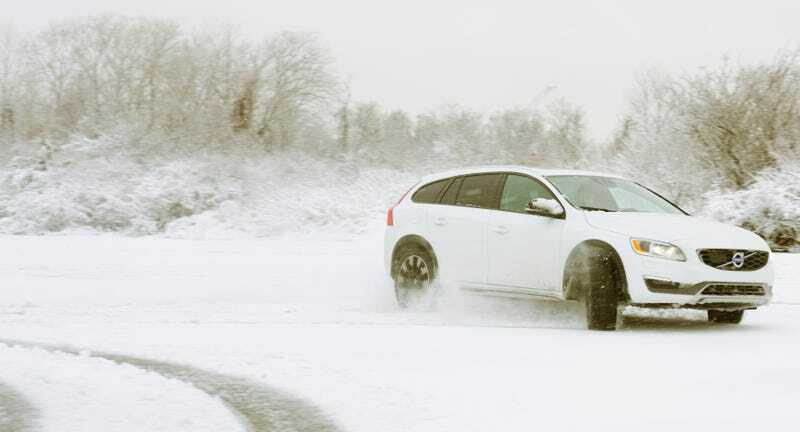 This is a Volvo V60 Cross Country that my coworker Mike Ballaban was driving last week out in the snow. As you can easily note, the car was not particularly enthusiastic about the plan. This is not a denigration of the sweet Volvo V60. It’s a tall, Swedish wagon, built to protect its occupants. It is not made for sliding around past the limits of traction. It is made to remain in control at all times. Its onboard safety systems are precisely what made it so displeased with our brief attempts at donuts, just as they’re precisely what make it such a good demonstration of what understeer looks like. Look at how far past their limit of traction these the front tires have gone. They’re just dragging along the ground, kicking up snow as they scrub. That setting was a lie. The traction control never fully disengages, and the car hastily snatches at the brakes as it detects a slide. The whole car heaves around, corner by corner, juddering with an extremely displeased attitude. The AWD system did seem, in a few choice moments, to send power to the rear, but the traction control kept any fun from happening. That said, the traction control was doing a pretty good job of keeping the car, well, controlled. It limited speed wheel-by-wheel to get the car to turn the car in spite of the slippy, slushy, snow. If it hadn’t been on (and the car didn’t have the ability to send power to the rear wheels), the Volvo would have skidded wide. What you want to do at that point is ease off the steering and ease off the gas. You can see that my coworker Mike had the wheel cranked all the way over and his foot was hard down on the gas. That wasn’t helping him any. The car was able to get sideways, but it took me most of our Top Secret Jalopnik Test Facility Bunker Area doing an improvised slalom to get the thing to slide. The pure pendulum force of momentum was the only thing getting this Volvo crossed up. It is possible that there is a secret code to get the car to unlock some oversteer potential. It might be as crude as pulling the car’s ABS fuse. But as far as I can tell, understeer is what you get, and this is how it looks.